Carignano Square in beautiful Turin, Italy. 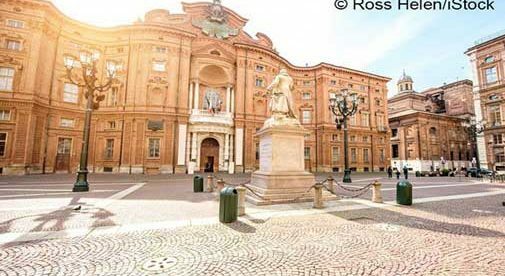 For the past eight years, New Jersey native Michelle Bottalico has called the Italian city of Turin home. Along the way, she’s furthered her photography business…acquired citizenship through her ancestry…and even met her husband-to-be. “After traveling around Italy, I liked it so much that I decided to look for work and live here. I was already a photographer in the U.S., and this was something I could do in Italy too,” she says. Today, Michelle specializes in portrait photography—taking photos of newborns, babies, children, families, and bridal couples. Her clients are both Italian and foreign, including American expats who work in Turin. “I do photo shoots for them so they can remember their time in the city,” she says. “I don’t work in a studio, because I prefer a more spontaneous style, and if I’m not working in clients’ homes, I use the city of Turin as a background,” Michelle says. Michelle has become enamored with many aspects of her new life in Turin, which has a population of about 900,000 people. “Things I love are speaking Italian, the open air markets in the city (especially the biggest one, Porta Palazzo, which has a section where the local farmers sell the food they grow), the closeness to the Alps where there are beautiful places to hike, the more relaxed way of life Italians have, the tradition of aperitivo in the evenings (going out for a drink and dinner buffet for a little more than the cost of the drink), and the opportunity to see new ways of life,” she explains. Turin is the capital of Piedmont, a region that’s celebrated for its Barolo wine and truffles, as well as its chocolate, rice, and breadsticks. Piedmont is also the birthplace of the Slow Food movement. In addition to its rich cuisine and dynamic cultural offerings, Turin has much to offer socially. “Turin is full of bars and restaurants and places to go out, and there are a lot of events and festivals in the city. I have met people through Couchsurfing, which along with the hospitality part of it, also organizes social events, and also through Meetup, which posts many different kinds of events, including a group for people to practice languages they’re learning. That’s where I met my fiancé,” says Michelle. And even though it’s a cosmopolitan city, Michelle says that rent, internet plans, and groceries are all very affordable in Turin. Michelle has explored much of Italy, but she says that visits to some of her ancestral towns have been the most memorable.